As a work-at-home business owner, I don't have a lot of time to spend on my hair. More often than not, my hair ends up in a ponytail or a bun. But, sometimes (a lot) I get bored with the bun or I have a quick video conference I need to do, and I want to look like I made an effort. That's where the braided bun arrives. The French braid bun is quick, and it looks like you spent a lot more time getting ready than you really did. If you need something that's pretty and easy, you'll want to try one of these tutorials. If you have long hair that tends to get wavy or curly, this is an effortless look that only takes a few minutes to master. A little bit of pancaking can make help loosen up a braid that's a bit too tight for a fuller, more relaxed style. For days when you want something a little more pulled together, or you just need to get your hair out of your face an off your neck, this Bohemian bun is a good choice. It's quick, super comfortable, and likely to stay in place all day. This is such a cute look for little girls, especially if they love to run, play, and get all sweaty. It's perfect for family pictures or just keeping their hair tidy for a day or two. And, don't be shy, teens and adults can rock this look too. If you only have a few minutes, but you want to look pulled together before you head out the door, try this 5-minute style. 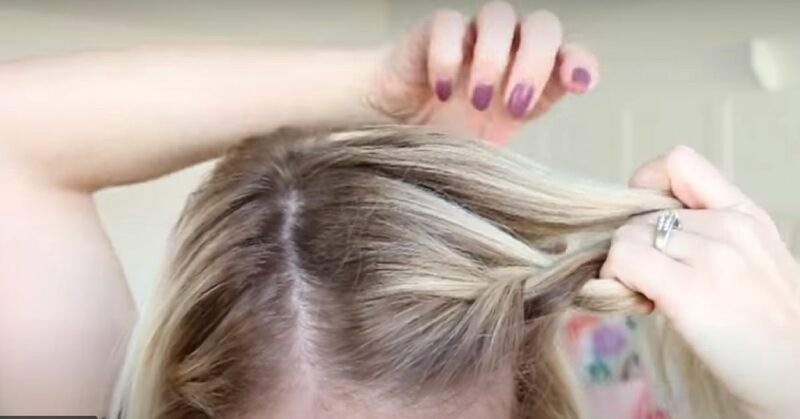 You just braid one side of the head, so you'll save time there. Sometimes you need a look that works for something a little more formal. This upside-down braid is a beautiful choice. This style is great going from workday to night on the town. Not going to lie, this braid may take a little bit longer, but the result is worth the extra effort. The beautiful braid is elegant and sturdy, so you won't have to worry about fixing your hair all day. Videos about braiding hair are surprisingly popular, but there is one that's currently taking the internet by storm and making headlines.